Bryan McEndaffer - Certified Yoga Teacher - Private & Group Classes - Fort Collins, Co.
Bryan would like to help you find a great balance in your life. He has been practicing yoga since 1990 and is a certified yoga teacher in the Viniyoga tradition that emphasizes a combination of asana, pranayama, bandha, sound, chanting personal ritual, yogic texts and Ayurvedic principals. With his training and intuitive style, he is able to teach you with a sensitivity to your needs of mind, body and spirit. 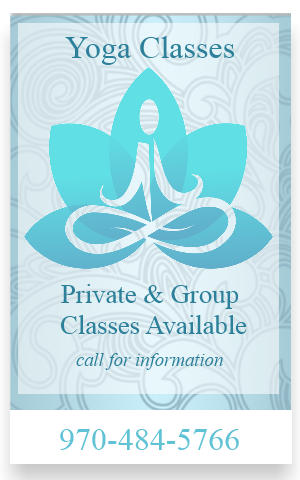 He teaches private yoga classes and group classes. Bryan feels that true beauty comes from within along with outward beauty. Good health, good posture, good mental attitude and an amazing hairstyle all contribute to your well being. Bryan's goal is to help people achieve their full potential by teaching them how to use yoga to relieve stress, lose weight, clear their mind and reduce pain. He enjoys working with older people and introducing yoga to people who have never experienced yoga's benefits. He finds it rewarding to teach private lessons to people who might not feel comfortable in a class situation. He has helped many people reduce and eliminate sciatic pain. Through gentle and progressive yoga poses, he can teach you how to align, lengthen and strengthen your lower back. He will lead you through yoga poses with gentle movements and deep breathing. Soon you will obtain better posture, better balance more self confidence, stronger muscles and overall better physical and mental health.